I have used the Vodafone 3G datacard since its launch a couple of years ago, however after a colleague mentioned that there was a brand new 3G Broadband card launched recently I decided to upgrade, especially as it was a free upgrade. The difference is impressive, although the card looks identical to the original card the speed is significantly improved. There has also been a significant update to the Vodafone Connect Software for the Apple Mac, even though it falls someway short of the functionality of the Windows version. The upload speed difference is remarkable; I have just uploaded 3 images to an FTP server, all over 1mb each in a matter of a minute. Vodafone has begun the roll out of the new 3G Broadband technology HSDPA (High Speed Downlink Packet Access) in the UK, at the moment the Broadband speed is only available inside the M25 and a couple of major cities (including London, Manchester, Sheffield, Tyneside, Liverpool, Bristol, Glasgow and the West Midlands). Where the broadband is not available the Datacard will fail-over to normal 3G and if that is also not available then GPRS. 3G Broadband is being deployed at 1.8Mbit/s which offers peak transfer rates for customers of around 1.4Mbit/s in downlink mode, approximately 4 times the speed currently available on 3G. The 3 G Broadband card is terrific, it certainly works well in London, and fails-over gracefully when out in the sticks, so for no extra money I have now a card that is as fast as my previous datacard out in the sticks, but substantially quicker in town. This is however of no use to anyone with a New Apple Mac Pro or an Ibook, which doesn’t have a PCMCIA slot, however there is an answer on its way. Vodafone UK have recently announced that it will be launching the Vodafone Mobile Connect USB Modem, a new version of its 3G broadband data card designed especially for users of the latest generation of laptops, desktops and Apple MacBooks, later this year. The device, which will be available in the autumn, will allow customers to access Vodafone’s high speed 3G broadband service by simply plugging it into the USB slot on their computer. The laptop and image transmission debate is almost as old as digital photography itself. I’m glad to see your sticking with the Apple system. Here were issued with IBM laptops and Bindows XP and it usually works. 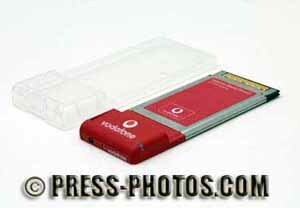 However I’ve been seeing snappers sending images from Palm tops or Pocket PC’s. Since were not issued with Photoshop, screens are too poor for accurate image processing, a simple system to send images from the card to the office is well within the capability of these little machines. Just wondering if you’ve had any experience of these? Nice site, glad to hear were all having the same rants. Yes I occassionally use Phojo on a Fujitsu 720 PDA, great for fire and wire jobs such as red carpet events. I would be slightly more worried about quality checking footy pics or similar on one. Coupled with a WiFi transmitter for the 1D bodies, I can on my own keep up with a two man team at a red carpet do.